The Flash Challenge starts in the beautiful Underwood Farms. The challenge is to create a stylish wedding band for guest judge Dean McDermot! Most people know Dean and his amazing wife Tori Spelling. Many of the competitors swung their bats at family and they were in the right ball park.Jessica made a tribal piece that could be worn by the bride and the groom because it was their names. Nicky need a little boost on his sketch and, thanks to Alexis, he designed a piece that's until death while Jon's is always forever. Alexis decided to make a lock and key with Tori and Dean's wedding date on it.London was all about family and Charlie tied the knot with a ring connecting love, marriage, and children. My favorites were Charlie's, Alexis', Jessica's and London's bands. Dean liked many of the bands, but the top two were Alexis and London. 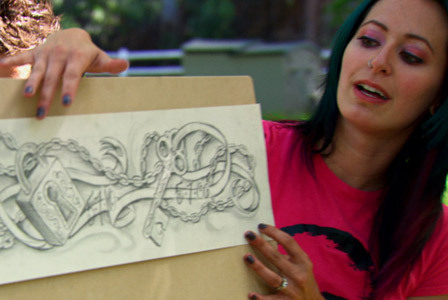 Alexis won the Flash Challenge and her reward was and extra hour to tattoo her Skin in the Ink Challenge. The Ink Challenges are always full of surprises. 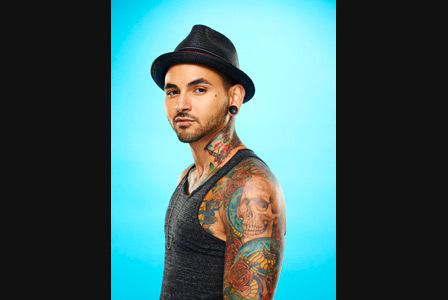 This time the competitors have to tattoo virgin Skins or skins who have never had a tattoo before. 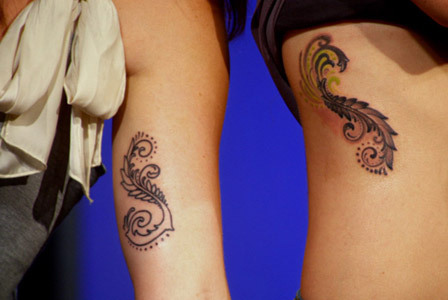 Everyone is well aware of how difficult it can be and on top of that they'll be tattooing two Skins instead of one. The Skins are all present with their best friends and the competitors only have 4 hours to complete their work. Except for Alexis, of course, she has 5 hours. Everyone's doing great with the adjustment, except poor Nicky. His Skin won't sit still for nothing and she might cost him the challenge. The Ink guest judge was Taryn Manning! Charlie: Wonderful feather and flock of birds flying away to symbolize Nola's life then and now. Her best friend recived a beautiful cactus flower with the same flock of birds. 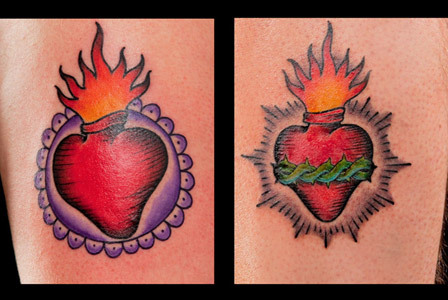 Jon: Created two burning hearts to symbolize the intensity of love. London: A nice feather with nice colors. Alexis: Army Skulls. One with a Parachute to symbolize the Airforce and one with Binoculars to symbolize a scout. 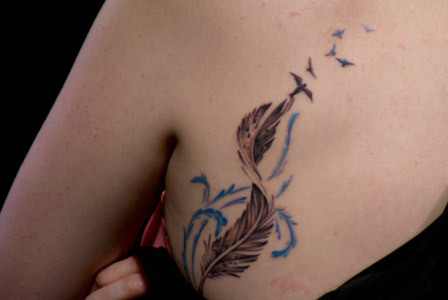 Nicky: A sweet swallow symbolizing the migration of friendship always returns. Jessica: Roller blades of careers. One worn and at the end while the other fresh and new to the scene. 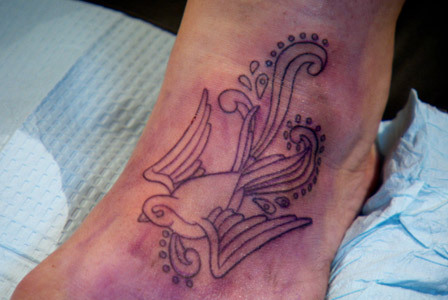 Kyle: Doves to keep the Skin's mother in memory forever. The judges were proud of the amount of work done in such a short time, but two competitors stood out. Alexis and Jon had the two best tattoos of the night. In the end Alexis came out victorious. However, the bottom happened to be a 4-way tie between Jon, Kyle, London, and Jessica. The judges have been very generous, but it was time for Jessica to go home. Was it really time for Jessica to go home? Who would you send home and why? 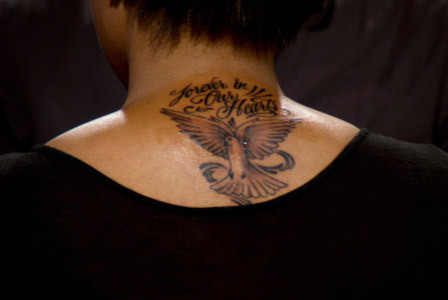 Voice your opinion and join us next week for the next episode of Best Ink. Last night Best Ink tapped into the emotions of everyone. 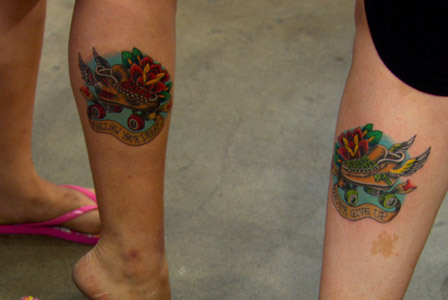 Many people get tattoos to resemble a hardship they've over come or a memory they want to keep forever. The show kicks off with a Flash Challenge that is rather difficult for some competitors. 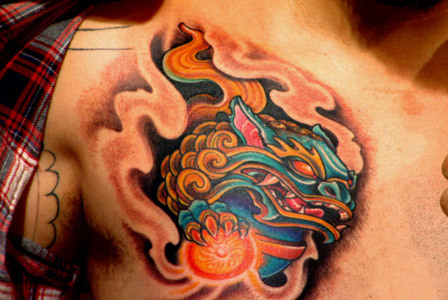 The Flash Challenge is designed to give the winner an advantage in the Ink Challenge. This challenge focuses on the creativity of an artist. It's like making a tattoo without the skin and ink. The challenge is to tell a story of an emotional time in their lives using flowers. Flowers are very colorful, so it should be easy for the artistic mind to run wild. Unfortunately it wasn't easy for Roman at all. All he did was complain about how hot it was and talk about how he "turns people into robots." The Winner of the Flash Challenge was Kyle with his wonderful bouquet of flower. They represented the love for his girlfriend and child at the top and the frustration of being away from them at the bottom. 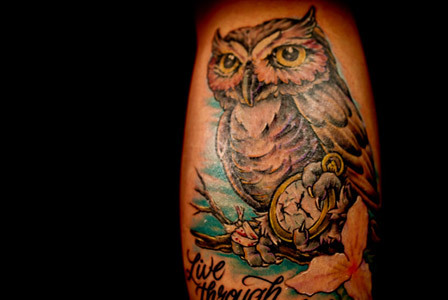 The Ink Challenge specializes in tattoo time management, creativity, and Skin satisfaction. 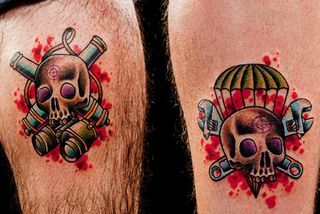 The clients on Best Ink are called Skins, pretty obvious why, right? The competitors had 4 hours to complete a tattoo that reflects an emotional time in their Skins lives. Kyle won the Flash Challenge, so he got to choose his skin first. The guest judge was Aaron Carter! 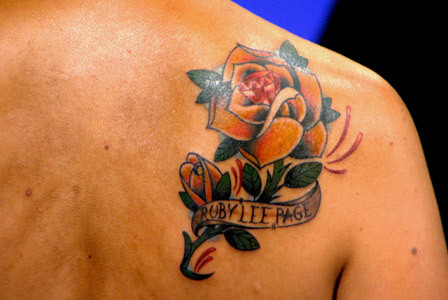 Kyle: Put a ruby inside of a rose to represent the Skin's grandmother, Ruby. Charlie: An owl in the night holding a shattered pocket watch with script saying "Live Though This"
London: Chinese guardian with great shades of red, blue, and gold. 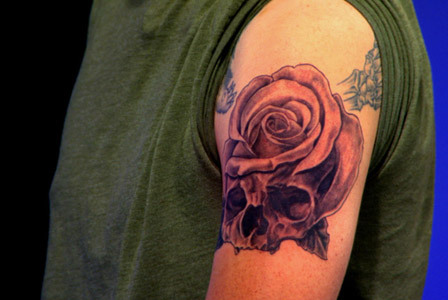 Nicky: Combine death of one and birth of another with a rose blooming out of a skull. 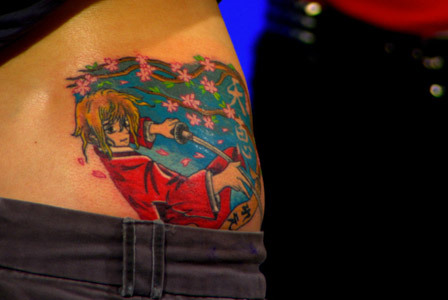 Jessica: A sweet samurai to show the warrior within her Skin's son. Jon: Advertised the Skin's brother on his favorite drink, Tequila. Alexis: A colorful secret garden with a script picked out by her Skin. The winner of the Ink Challenge was Charlie. She truly deserved it and that owl was amazing. When it came time for someone to go home, Roman threw himself at the bottom and said this show just wasn't for him. Good luck with you robot thing buddy! If you want a tattoo by you favorite Best ink artist got to http://paisanopub.com/bestink/ and enter the sweepstakes. Which tattoo did you love the most? 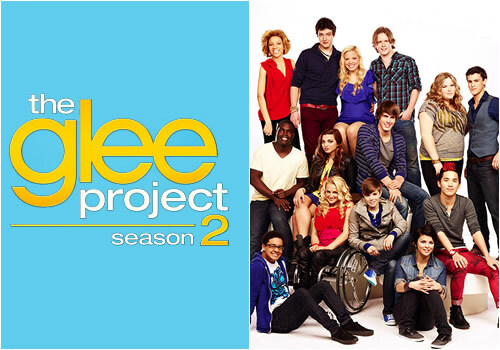 The Glee Project is back with the sound you know and love! 14 teenagers with the same dream compete to be the next cast member of Glee. Let the greatest voice win! Coming This Summer only on Oxygen! Get updates on your favorite shows on Oxygen. Soon I'll be covering primetime shows such as The Bad Girls Club: Las Vegas, Brooklyn 11223, and Best Ink. If you're a fan of Oxygen, be a fan of The Daily Brew! TV Rocks! has a great out look on what you've missed or never seen. Celebrities Kill TV, We Die For It!